This is a two page guide to go along with watching the movie, The Boy in the Striped Pajamas. I use this movie after we read the book Night. It is a great way to combine the two pieces and show numerous view points during that time. This file contains eight (8) different Journal Entrie prompts - students react and relate to direct quotes from the text. Discussion Questions - students respond to questions based on the book's story lines. Questions are organized in chapter groups to coordinate with the quizzes. The file contains both the questions and the answers. Holocaust Unit: "The Journey That Saved Curious George" Mega Unit! These are comprehension questions that go along with the Holocaust film, "Escape from Sobibor." They could also be used with the novel. The Reading Log - this file was designed to help students to organize their reading notes (identify major plot events and new characters plus their character traits). Also included are teacher chapter plot highlights and questions students should have answered in their reading logs. 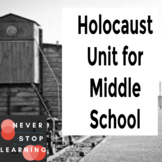 This is a 4 week long unit on the Holocaust I have used with my 6th graders. The unit includes lessons that engage students and also provides accurate assessments. The quiz on chapters 1 - 4 includes eight (8) multiple choice questions and one essay question. A student answer sheet and a teacher answer key are included. The quiz on chapters 9 - 12 includes six (6) multiple choice questions and two essay questions. A student answer sheet and a teacher answer key are included. Compare and contrast essay about survival -- works with any two Holocaust novels. Students will write a six paragraph essay comparing and contrasting the Holocaust stories studied in class. Additionally, they will make a connection to their own life about survival. The quiz on chapters 5 - 8 includes eight (8) multiple choice questions and one essay question. A student answer sheet and a teacher answer key are included.